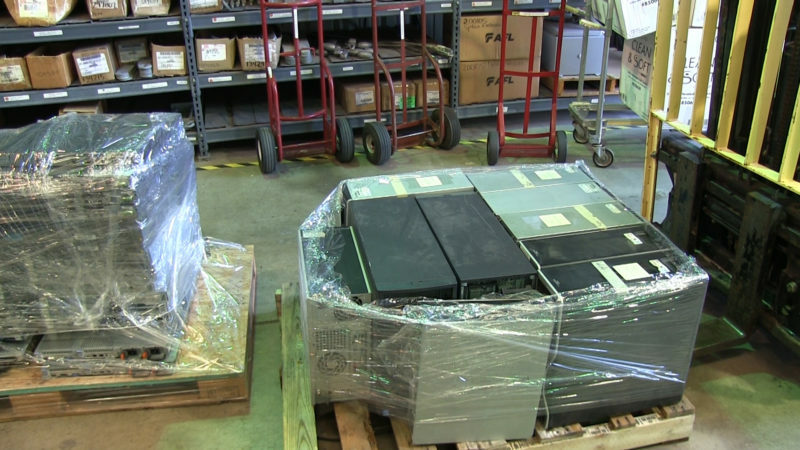 (BENSON) The pallet was piled high with computers, servers and other IT hardware as it was moved out of the Benson campus warehouse toward a waiting pickup truck, where Joel Todd and Tina Gudvangen stood by. A variety of hardware that is outdated for industry but completely functional for educational purposes awaits a new life with Cochise Technology District. Todd, superintendent of the Cochise Technology District/JTED (Joint Technology Education District), and Gudvangen, JTED program director, were eager to see the IT equipment that was being donated to the JTED program. “We’ve never had a donation like this before. This is really cool that Arizona G&T Cooperatives reached out to us with something we can really use. This will allow our schools to fill in some gaps and provide better service, and because it’s providing us with backup servers, it also lets us breathe a little easier,” Gudvangen said. “This donation from Arizona G&T Cooperatives is extremely valuable and will help us serve the students in the JTED program,” Todd said. 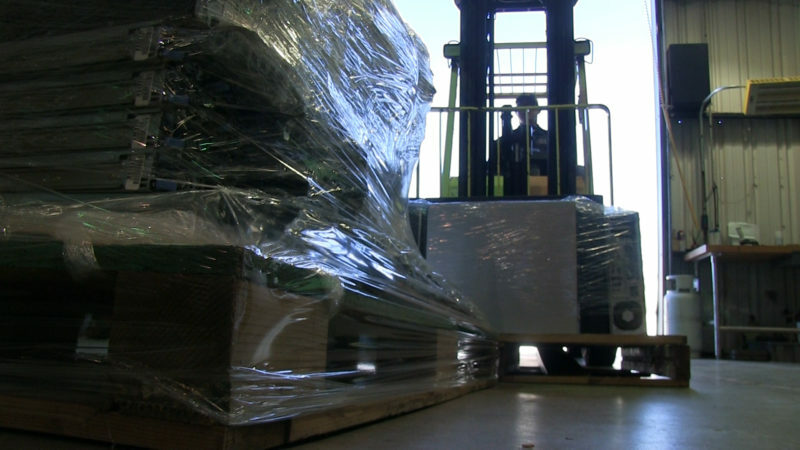 Pallets of computer equipment are moved by forklift to a truck that will take the hardware to Benson High School. The AzGT IT department “retires” equipment on a regular basis, but the latest round of retirements go Ryan Judd, manager of IT services, and Robert Eglinsdoerfer, IT desktop support/system administrator, talking about finding a use for it. “Ryan asked if I thought we could donate it to local schools, so I reached out and quickly connected with Tina and the JTED program,” Eglinsdoerfer said. Eglinsdoerfer was the perfect person to handle the project; he worked for two years in the Benson school district and four years in the St. David school district before joining the AzGT IT department. “Our equipment is upgraded on a regular basis and even when something is taken out of service, it has a lot of useful life left,” Eglinsdoerfer said. 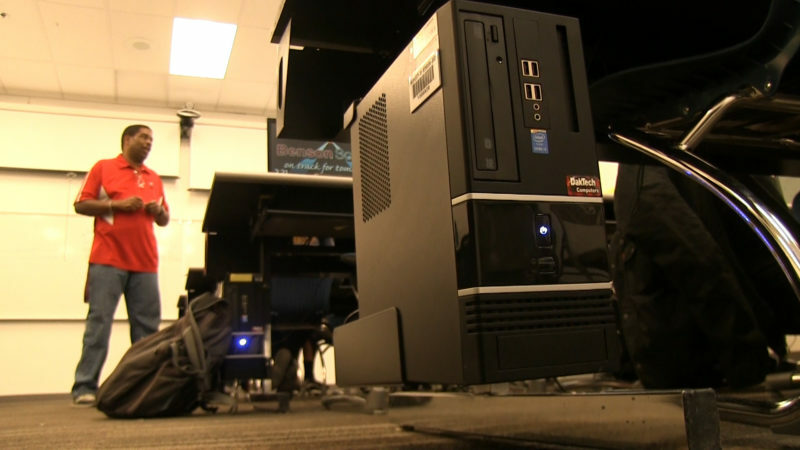 “We were able to donate servers, routers, switches, desktops, and memory hardware, all of which will provide teaching tools for the technology classes and add value to the JTED IT infrastructure. “These classes are really important. They inspire and train students to fill technology positions in our local area, positions that are needed in the workforce,” Eglinsdoerfer said. Gudvangen said some of the IT hardware will be used in the “virtual classrooms” that are a part of the JTED nursing program and the network technologies program. Computer equipment is necessary in a variety of functions for the Joint Technology Education District (JTED) that teaches subjects that range from nursing to network building. “We do them both the same way: by computer. The students can sit in the classroom in Benson, St. David, Willcox, Bowie, and the other schools where we have JTED programs, and watch and listen to their instructors and take classes using the virtual classroom technology that will be aided with this donation,” Gudvangen said. Benson High School senior Zackary Wiegand is learning how to build computer networks and fight cyber attacks. Wiegand says that JTED keeps student motivated by offering classes that lead them directly to careers.